Our Second Generation (SG), Fully Enclosed Shelter (FES) LIDS assemblies provide a comfortable area where personnel can work or sleep safely within a fully enclosed tent structure. It can also serve as a central staging/collection point for incident responses or forward deployed command and control operating stations. The LIDS FES shelters consist of one lightweight inflatable shelter which is 10’ x 10’ x 8’ in size and has a fully enclosed canopy. All FES assemblies can be joined together end-to-end with other FES units using an interlocking Velcro connection ensuring a water-resistant seal between shelters. This shelter-to-shelter connection option is standard on all our new LIDS FES units. Our FES assemblies are completely enclosed and have an Environmental Control Unit (ECU) Heating/Cooling Integration Chute that allows heating and cooling units to be used to control the temperature within the shelter. Tent shelter ends can be rolled up to allow shaded airflow through the shelter. This shelter significantly reduces exposure of personnel to high heat conditions associated from direct sunlight. It packs neatly into our weatherproof, lockable, harden and soft type LIDS shelter container capability. 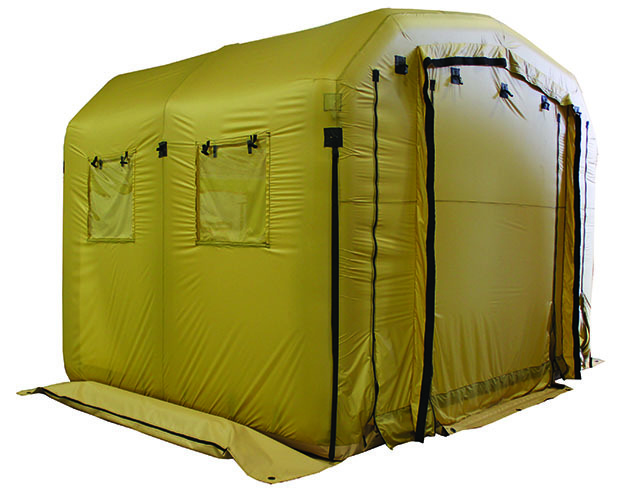 The benefits of owning this ultimate Fully Enclosed Shelter assembly translates into unparalleled logistic improvements, including a smaller unit/team response footprint; reduced tent setup/breakdown times, and fastest relocation times during extremely austere and diverse emergency response conditions within all types of field operations.